PediaSure SideKicks is nutrition to help fill gaps. Each shake is a source of 10g protein, 3g fiber*, and 25 essential vitamins and minerals for kids who are growing fine but missing key nutrients. * Contains 6 grams of total fat per serving. † Not for children with galactosemia. ‡ Natural and artificial flavors. Did you know that most kids aren’t getting the fiber they need? Find out how-you can incorporate more fiber into your kid’s diet. What is the difference between PediaSure Grow & Gain with Fiber and PediaSure SideKicks? Why would I choose one over the other? PediaSure Grow & Gain and PediaSure Grow & Gain with Fiber are sources of complete, balanced nutrition to help kids grow when inadequate growth is a concern. PediaSure Grow & Gain and PediaSure Grow & Gain with Fiber shakes have 240 calories per 8 fl oz. Click here for a side-by-side comparison of all the PediaSure products. 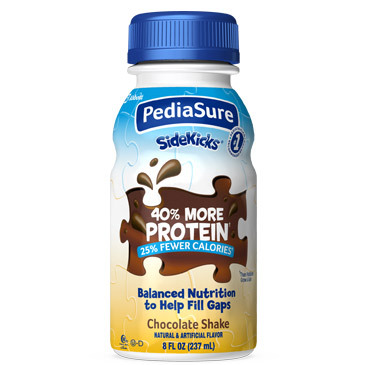 * 40% less calories (180 cal vs. 240 cal, and 30% less fat (6g vs 9g) for PediaSure SideKicks shakes vs. PediaSure Grow & Gain per 8 fl oz serving. Still searching? If your question isn't answered here, call our PediaSure Feeding Expert line at 800-986-8793 for Live Nutrition Support with our trained experts, including dietitians and nurses. 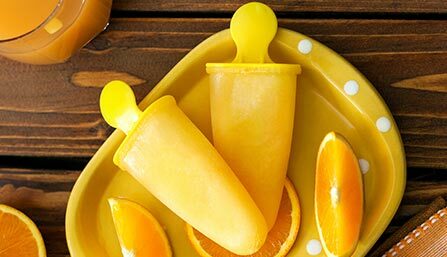 Can I cook with PediaSure? Do you have any recipes? Are coupons available for PediaSure products? Yes! Click here to sign up for our monthly e-newsletter and valuable savings on PediaSure products. You’ll receive a $3-off coupon just for signing up. 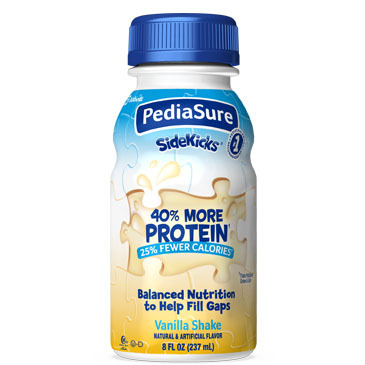 PediaSure SideKicks is rated 4.4 out of 5 by 59. Rated 5 out of 5 by VeeMcDee from Use to balance nutritional intake Not using daily only a couple of times per week to add as a nutritional supplement. Rated 5 out of 5 by Sherilynn62 from Perfect for my picky eater! Love love love this product. This has been a life saver for our son who has sensory issues and is a extremely picky eater. Thank you! Rated 5 out of 5 by Jaavchicaloca from The kids love it I don’t have to ask my kids to drink it because they like it. Rated 4 out of 5 by Dayna from Great My daughter loves it. Helps maintain a balance diet. Rated 4 out of 5 by Christie10ac from Daughter loves it My daughter has drunk this every single morning for several years. I think it tastes horrible but she loves it. She is a picky eater, so we use it as a supplement. Rated 5 out of 5 by KellyMom from My son loves it Whether it's chocolate or strawberry, my son is staying on track with his growth despite being a picky eater, so I'm grateful for Pediasure.